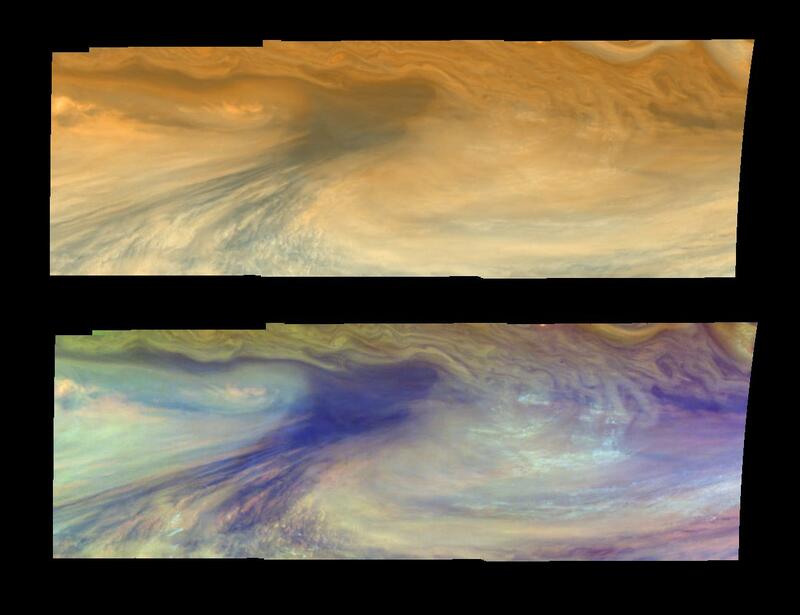 True and false color views of Jupiter from NASA's Galileo spacecraft show an equatorial "hotspot" on Jupiter. These images cover an area 34,000 kilometers by 11,000 kilometers (about 21,100 by 6,800 miles). The top mosaic combines the violet and near infrared continuum filter images to create an image similar to how Jupiter would appear to human eyes. 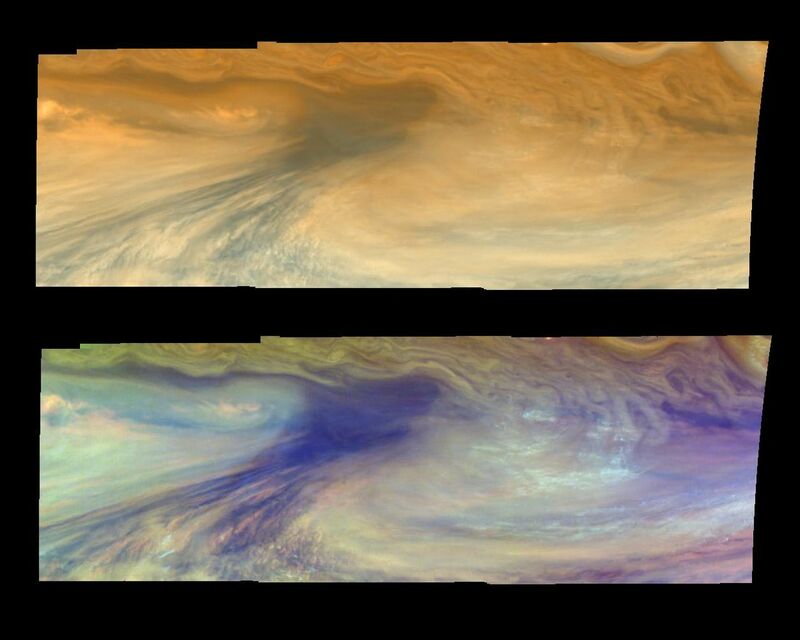 Differences in coloration are due to the composition and abundances of trace chemicals in Jupiter's atmosphere. 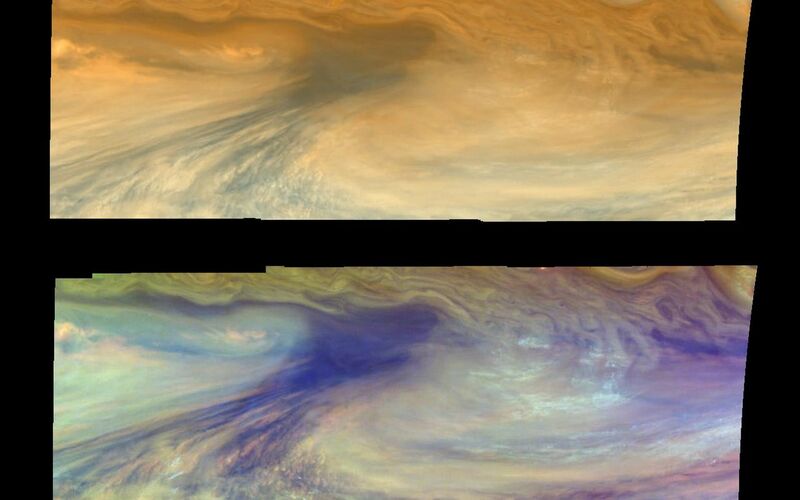 The bottom mosaic uses Galileo's three near-infrared wavelengths displayed in red, green, and blue) to show variations in cloud height and thickness. Bluish clouds are high and thin, reddish clouds are low, and white clouds are high and thick. The dark blue hotspot in the center is a hole in the deep cloud with an overlying thin haze. The light blue region to the left is covered by a very high haze layer. The multicolored region to the right has overlapping cloud layers of different heights. Galileo is the first spacecraft to distinguish cloud layers on Jupiter. North is at the top. The mosaic covers latitudes 1 to 10 degrees and is centered at longitude 336 degrees west. The smallest resolved features are tens of kilometers in size. These images were taken on December 17, 1996, at a range of 1.5 million kilometers (about 930,000 miles) by the Solid State Imaging camera system aboard Galileo. The Jet Propulsion Laboratory, Pasadena, CA manages the mission for NASA's Office of Space Science, Washington, DC. This image and other images and data received from Galileo are posted on the World Wide Web, on the Galileo mission home page at: http://galileo.jpl.nasa.gov. Background information and educational context for the images can be found at: http:/ /www.jpl.nasa.gov/galileo/sepo.